This exquisite Pure Silk Swarnachari Saree from our own Bengal. A must have in every wedding trousseau. The mythological motifs all handwoven with zari showcases rich Bengali art and culture. 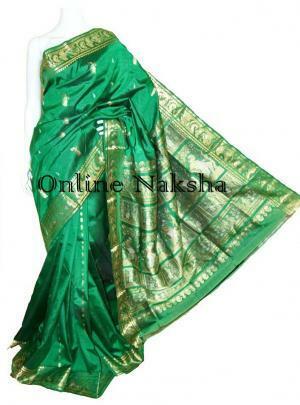 Online Naksha offers wide variety of Baluchari & Swarnachari Sarees.